Google gives Abbey Road the virtual reality experience | What Hi-Fi? All you need is Google Cardboard, the company's virtual reality viewer, and a smartphone in order to explore a virtual Abbey Road Studios, complete with a surround sound guided tour. Abbey Road Studios and Google teamed up last year to give the world an inside look at the famous recording studios, and now it's taken things a step further with a virtual reality tour. 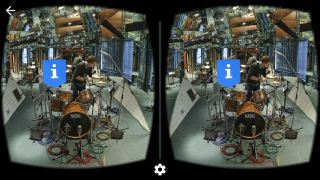 Download the Inside Abbey Road - Cardboard Android app to your phone, partner with a Google Cardboard VR viewer and you can be enjoying a tour by Giles Martin, son of the late George Martin, the famous Beatles' producer. The Beatles undeniably made Abbey Road world famous, but, as well as uncovering more from The Fab Four's history, the virtual reality experience lets you listen to a London Symphony Orchestra recording and hear the finishing touches applied during a mastering session. The app promises to let you explore the studio, while also hearing it in action - complete with surround sound. There are 360-degree videos, guided tours and the chance to play with some of the gadgets inside the studios, including the mixing desk. Sam Smith, Jay Z, Sir Edward Elgar and Paolo Nutini are some of the other artists featured, with audio tours featuring Lauren Laverne and engineer, Mirek Stiles. Abbey Road Studios’ managing director, Isabel Garvey, said: “Abbey Road is an extraordinary place that has been instrumental in creating some of the most iconic music in the world from famous film scores to classic pop albums. With this incredible virtual reality technology, music lovers will be fully immersed in the sights and sounds of Abbey Road in a way we never could have imagined."